Last August I was offered the job of creating a logo for this DC title, which I accepted. 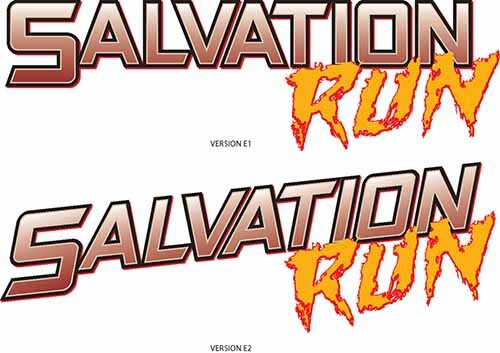 I was given the cover art for the first two issues, and the script for the first issue as reference by Ken Lopez at DC, and the suggestion that the two words be angled and offset, not centered, to add interest. This was a tough one for me, mainly because, as is often the case these days, the title of the book has no visual hook at all. 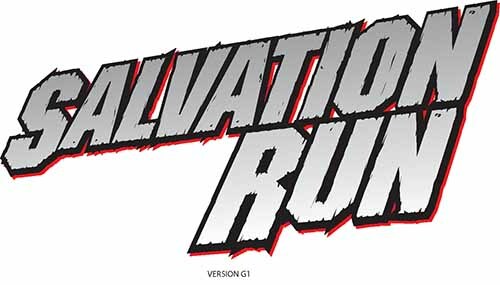 If it were a religious story I could have made the T in Salvation a cross, but of course it’s anything but: a collection of DC villains is sent off to a distant planet to fend there for themselves. The title suggests a gritty action movie sort of thing, and the other planet angle might bring in some science fiction ideas, but as it’s an ensemble book, I couldn’t use character symbols or costume details for a visual springboard either. 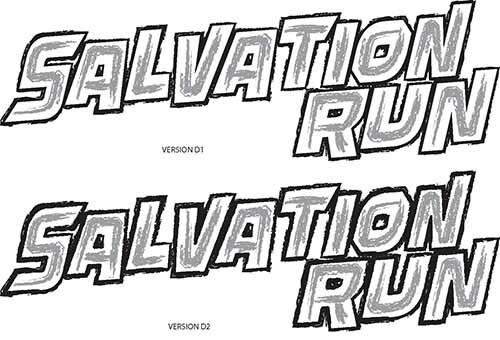 When faced with this sort of assignment, I go through my font files to see if I can find a few that might work, with tweaks, and that’s what I did for my three initial sketches. 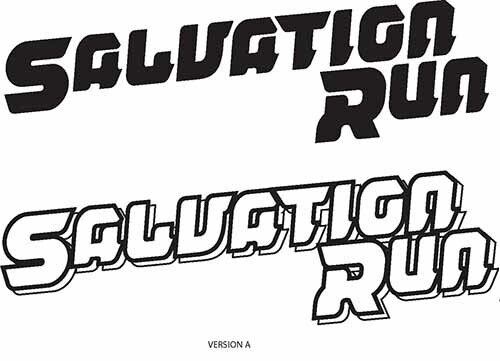 Sketch A had what I thought of as a futuristic look and bold, if rounded letter forms. Sketch B began with very wide block letters to which I added an inset of rough brush letterforms, and on the lower one, a similar rough outer edge. Sketch C went further down the Science Fiction route, this time with a more angular and pointed font that had some interesting cross-strokes. These were sent in, and of the three, DC liked version B the best. I was asked to do some further variations on it. Version D went progressively heavier with the roughened outer edge, and also added roughness to the inner white edge. Some time passed, and word came from Ken that some at DC weren’t happy with this direction, and he asked if I could do three more completely new sketches. I agreed, and this time added color, hoping it might help sell one of them. Version E used completely different approaches for each word, which I thought would give DC more options, as they could mix and match across these three new sketches. A conservative SALVATION here matched with a very rough RUN. This is again two fonts, but closer in feel to each other. Another block letter SALVATION, this one with notches, and a science fictiony RUN. A little hard to read on the second word, but I really like this font and keep hoping it will work somewhere. 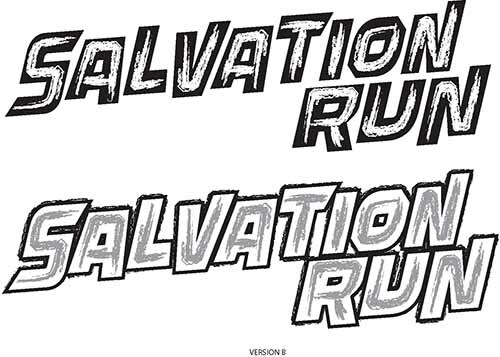 Two more fonts, a rough-edged SALVATION and an angular RUN. One final thing I did was to enlarge the R to add some variety. This version was a hit, and Ken told me to send it in. Before I did that, I made some minor tweaks to the letterforms, so that the two As and two Ns were not exactly the same. Here’s the final version. They compressed it some vertically on the covers, which makes sense, as it leaves more room for art, but otherwise I think they used it as shown here. Not the most exciting design, but on this series, the logo isn’t selling it as much as the contents are, I think. 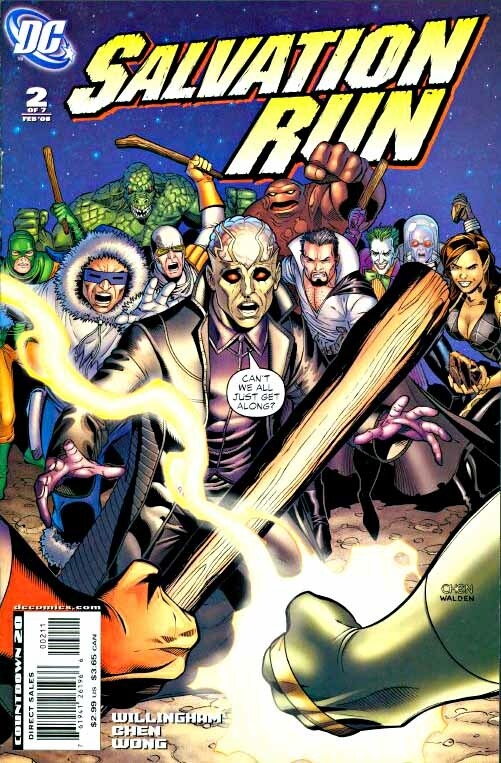 If you want to read about these characters, and this series spun off other DC universe events, you’ll pick it up no matter what the logo looks like. But I’m glad I had the chance to put one on there. 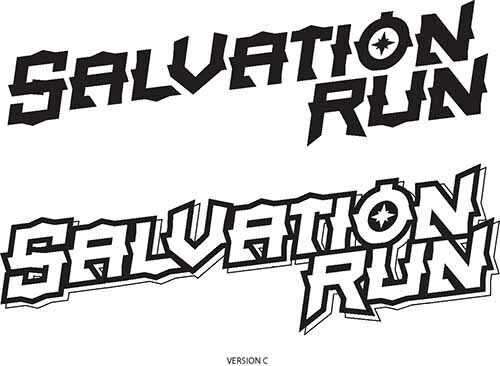 This entry was posted in Logo Studies on March 13, 2008 by Todd. Huh… I prefer versions B and D myself. By a longshot. If I just saw that logo at the top of a comic on a spinner rack, I’d probably pick it up to see what it was.